Uglyworld #255 - Daytrip to Monschau, originally uploaded by www.bazpics.com. 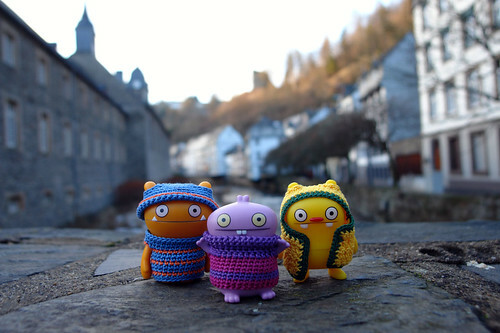 Wage, Babo and Jeero suggested to Scottish mum that instead of taking the long drive down to Koblenz which was already planned that we should go visit Monschau which was only a 30-40min drive from where we live outside of Aachen. The village of Monschau is pretty cool, it is high up in the hills to the South West of Aachen and as such there is more snow around. The streets of the village are all small and are surfaced with cobble stones, with many buildings having that cool "leaning" style to them as they've moved a little since they were first built. Wage, Babo and Jeero were all dressed for the colder weather and after seeing how fast the water was flowing down the river, they decided to pose on one of the bridges with the steeple of the church at the village square poking up over the buildings which lined the river, and the outline of the old ruin which sits on top of the surrounding hillside.